Some of you may recall those old British Telecom adverts with a tag line “It’s good to talk” starring Bob Hoskins. Of course, back then phones were used for talking! Perhaps the adverts would now be a little different- it’s good to swipe right? But I’m digressing, understanding of language development stages and strategies on improving oracy skills is not just good- but it’s vital in ensuring that our young people have honed a life skill that can impact social mobility and academic achievement. A few months ago, the Department for Education (DfE) published data that showed 28 per cent of four and five-year-olds lacked basic communication skills expected of them; (such as being able to talk about events in the past or future). There is further data that highlights how in some areas of the United Kingdom; more than half of children are starting school with poor language skills. Such data is worrying when one considers the clear correlation between poor early stages of language development and lower attainment at GCSEs. Excellent Communication skills are often highly sought as a key attribute from employers based on recent surveys. Hence being able to support pupils with language and communication difficulties is critical for employability. However, many may not be aware that poor communication skills can also impact the mental health of an individual. Last year, the University of Arizona published a study which highlighted how poor communication skills often lead to stress and loneliness, which can negatively affect mental health too. Unfortunately, advances in technology is not helping our young to communicate. The less face-to-face time that our children have with others makes it harder for them to communicate and listen effectively. This lack of social interaction is damaging, especially when one considers that British teenagers are amongst the world’s most extreme internet users. So we know that excellent communication skills is essential for our pupils overall wellbeing and this means that schools should be making a big push to ensure that we all do more to ensure that pupils have a key focus on oracy throughout their schooling. 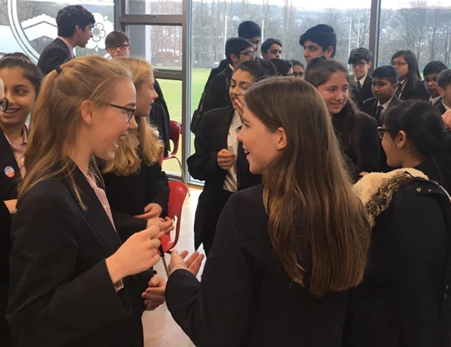 Structured dialogue has always been a very important part of linking and we are always looking at innovative ways of ensuring that pupils have the right tools to develop their communication skills. If you would like to share ideas on how you promote dialogue or need some advice; please get in touch. It’s not just good to talk, it could change our pupil’s lives for the better. The picture above shows Year 9 pupils on their second linking visit. Previous: Happy Academic New Year!